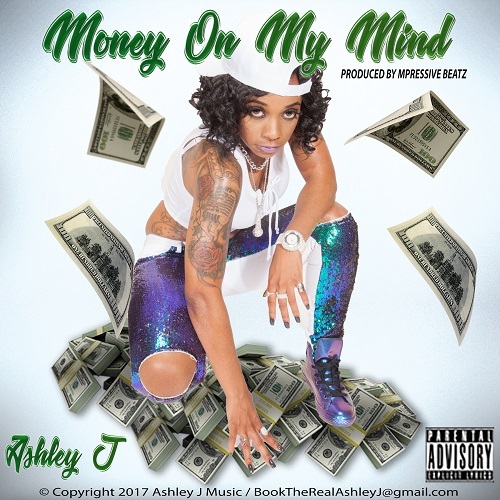 MONEY ON MY MIND – expresses the hunger Ashley J has dedicated her focus to. She writes music in a way that will make you feel what she’s lyrically speaking. The message on this #HOT single takes your mind to revealing how she has managed to stay committed to her craft but also making a living for her survival. Ashley J is a phenomenal female lyricist who motivates listeners to be self-sufficient when it comes to getting money. She feeds your mind, not just about money on this record but believing in yourself. She’s fearless and passionate about music but making money from her talent is not why she raps. Ashley J does what she does to inspire and be loved by the world.